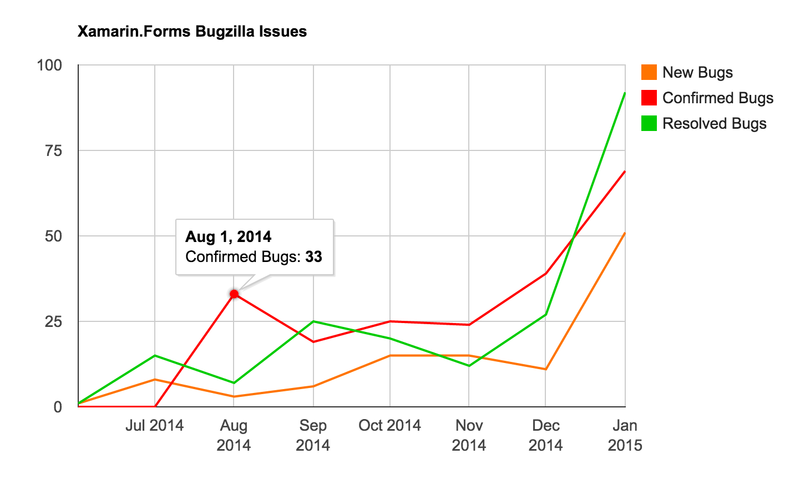 I'm a fellow subscriber of Bugzilla and I have reported some issues for Xamarin.Forms myself. The chart above shows an example of the bugs count in Xamarin.Forms by status. Data are taken from the Xamarin Bugzilla website via the CSV feed. Its interesting to see how Xamarin.Forms "hype" is growing and more time and resources are invested to make it stable. The charts are updated once a day with the latest information. The webapp is deployed on Azure Websites and uses node.js & express, Google Charts and bootstrap for its purpose. The charts are generated for Xamarin.Forms, Xamarin.Android and Xamarin.iOS products. If you are interested in more products/platforms, just PM me.